Many have worn the crown but few have carried the freak flag of rock to such fantastic heights as Earl Grey. In spite of a seemingly endless procession of heirs and imitators, the Earl’s star shines as brightly today as it did on first rising in the early 1970s. Listeners who might have been baffled by his colorful affectations were instead delighted by the seductive, mysterious character of his songs. Surely his childhood exposure to folk music on a remote Mediterranean island contributed to his fresh sound, as did his travels in India, but his perfect blend of style, creativity and irresistible guitar hooks always seemed like the product of other-worldly origins. Wherever Earl Grey came from, he’s ours now and this true classic continues to surprise and delight us. 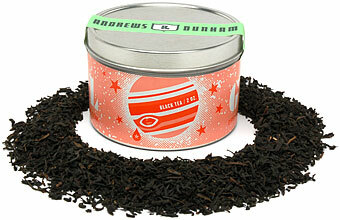 Earl Grey is a black tea scented with the oil of bergamot. Steep in boiling water for five minutes and enjoy in whatever manner you please. I guess it’s no real secret by now that I adore Earl Grey tea. Now that is not to say that I like all Earl Grey teas; just because you’ve tried one Earl Grey tea does not mean that you’ve tried them all. This is one of my favorite Earl Grey teas. It is also one of the more unusual Earl Grey teas that I’ve come across. Most of the Earl Grey teas (that I’ve tasted) possess a certain sharpness to them – a sharpness that comes from the bergamot oil used to flavor the tea. It is a difficult sharpness to describe – it is a citrus-y, flowery sharpness that almost comes across the palate like perfume – almost, but not quite. Some of the Earl Grey teas that I’ve tasted DO taste like perfume – and these are the ones that I find rather distasteful. I mean, who wants to drink perfume? And yet, the really good Earl Grey teas somehow manage to skirt the line between tasting good and tasting like perfume. It is a thin, sharp line. Hence… the aforementioned sharpness. So then, you may be wondering, just how is this Earl Grey tea different from others? This one is different because it avoids that sharp line completely. Rather than that typical Earl Grey sharpness, this one has a smooth, almost seamless flavor. It is citrus-y. It has a floral note. But somehow, these two have formed a united partnership that has minimized the characteristic sharp note to almost non-existence. It is an extraordinary Earl Grey tea! Andrews & Dunham suggest a five minute steep time for this tea, but, as my palate tends to be somewhat sensitive to bitterness, I chose not to steep this long. It’s been my experience over these many years with tea that almost every black tea will get bitter once it brews past that 4 minute point. There are exceptions to that, of course, but, for me and my palate, this has become the standard by which I brew most teas. I have brewed this tea both at 3 minutes and at 4. I have found that with the 3 minute steep time, I get the flavors that I mentioned previously: a fruitier bergamot with only a hint of floral quality. When I steeped at 4 minutes, I found that the bergamot possessed a stronger floral quality than at 3 minutes which seemed to slightly overwhelm the fruitier notes that I liked so well at 3 minutes. So, my preference is for 3 minutes in boiling water. So, experiment! Try it at 5 minutes, at 4, and at 3, and see which you prefer. Just try it! If you like Earl Grey tea – you might just fall head over heels in love with this one! But you better hurry – because it’s part of a limited edition series, and won’t be around forever!